For many years now, the small Baltic country of Lithuania has been known as a breeding ground for some of the world’s best basketball players. Many people would be hard-pressed to name anything else that the country is known for, much less find it on a map, but that would not have been a problem in the early 15th century. You see, at its peak in 1421 the empire of Lithuania comprised not only the country we know today but also parts of today’s Latvia, Poland, Belarus, Ukraine and Russia itself. 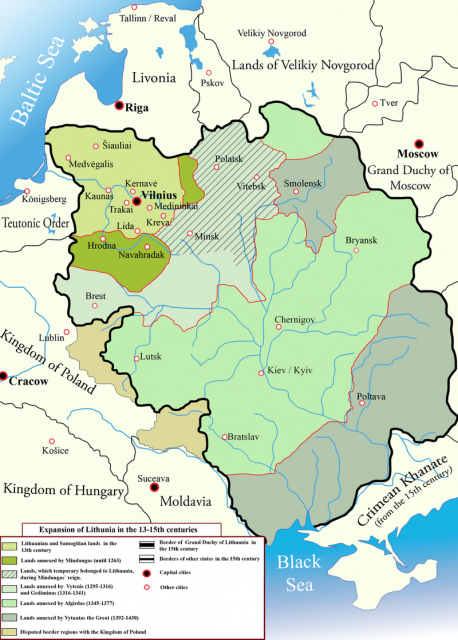 Later in its history, the leading families of the Grand Duchy of Lithuania, as it was known, entered into a union with the Polish aristocracy, and the Union of Poland and Lithuania came into existence. This coalition, not necessarily dominated by the more numerous Poles, grew even more powerful. In 1575, the territory comprised a Lithuania larger than the Poland centered around Warsaw, parts of today’s Czech and Slovak Republics, the German border states with Poland, Estonia, Latvia, Ukraine, Belarus, and the western part of Russia excluding St. Petersburg, the Russian capital. Prior to 1387, the Lithuanians were polytheistic people, living in small and medium-sized settlements mostly in the densely wooded and protected lands around Vilnius, today’s capital. 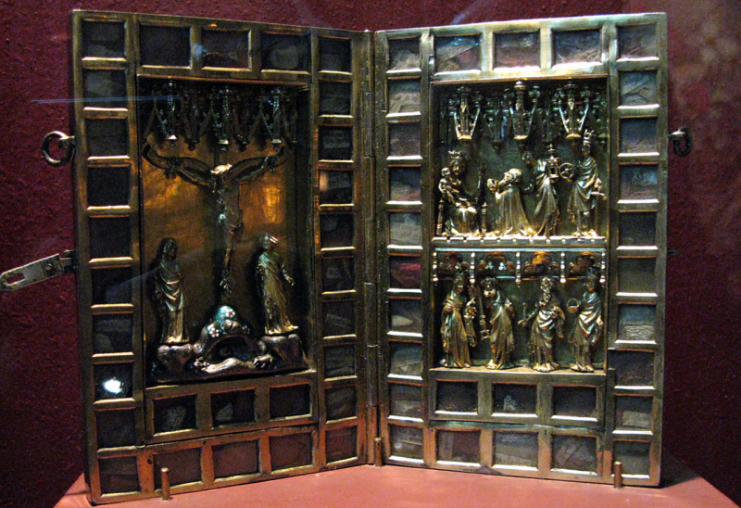 The first written reference to the Lithuanians is found in 1009 in the “Annals of Quedlinburg,” a recording of history and events kept by monks in the abbey at Quedlinburg in Saxony. This chronicle also states that the Lithuanians were subject to attack by the Rus, the Swedish Vikings who had established their center of power in the border area between Russia and Ukraine. The Lithuanians paid tribute to the Rus for a short time, but within one hundred years, the tribes in Lithuania appear to have united and were strong enough to mount their own raids, not only on the Rus but on the powerful city-states of Polotsk and Pskov. One of the Lithuanians’ main enemies were the Christian military orders of the Teutonic Knights and the Livonian Order, both of which were dedicated to spreading Christianity, mostly through military crusade and force. This forced the many tribes of Lithuania to unite behind leading noble/war chiefs. One of these was Mindaugas, who eventually became the most powerful of the Lithuanian dukes. Another war chief, Vykintas, defeated the Knights of the Livonian Order so badly that the remainder were forced to unite with their rivals, the Teutonic Knights. Defeating and causing disarray in their main enemy allowed the Lithuanians to expand to the east into today’s Belorussia. Needing protection from the Russians and others, some Belorussian tribes requested that Mindaugas become their overlord. Mindaugas was a duke and a war-chief, not a king, so he had rivals. One of his problems was that he was always at war with his Christian neighbors, who sought to either convert or kill him. 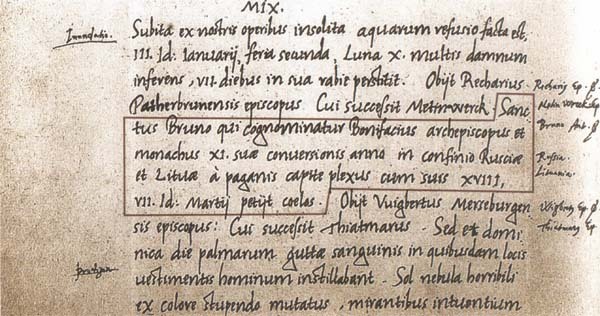 Finally in 1251, Mindaugas was baptized by the Pope, and was recognized King of the Lithuanians. This helped him gain power over his pagan competitors, and Mindaugas allied himself with a variety of former enemies, then turning on them when it suited him. Mindaugas is recognized as the first ruler of a united Lithuania, but his ambitions were greater than his ability, and he suffered a number of defeats when he tried to bring the Latvians and Estonians into the Lithuanian fold. Eventually, he and his two sons were assassinated by a rival. Six years of uncertainty and infighting took place to replace him until Traidenis came to power and expanded the empire even further, almost always involved in a battle against someone throughout the 1270s to mid 90s. By the 1290s the Baltic region was dominated by the Lithuanians and the Teutonic Knights. One of the things that benefited the Lithuanians was the arrival of the Mongols on Russia’s eastern borders. Weakened and threatened by the Mongols, the Rus’ western territories were less well-protected and the Lithuanians moved in. By the beginning of the 1300s, they controlled much of western Russia and Ukraine, down to the Black Sea. This gave the Lithuanians immense trading opportunities which gave them the riches to power their military machine. At the beginning of the 1400s, the man who is considered the greatest among all pre-modern Lithuanians, Vytautas the Great, came to power. His greatest victory, and perhaps the greatest victory in Lithuanian history, came at the Battle of Grunwald (or Tannenberg), where Vytautas’ coalition of Lithuanian-Polish forces defeated the Teutonic Knights in 1410. 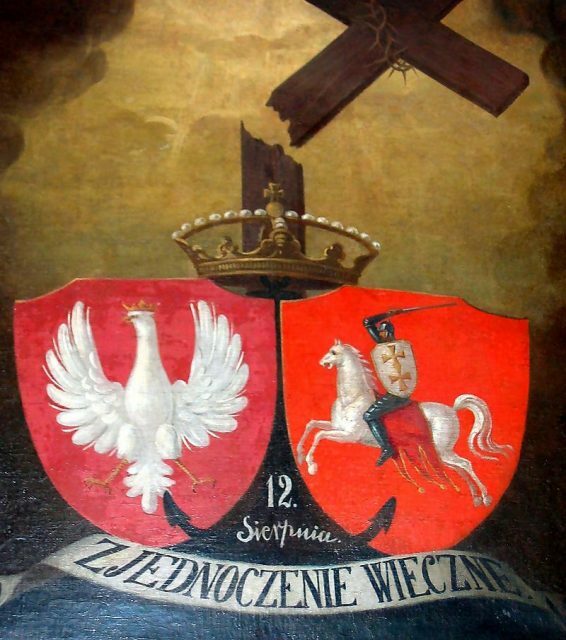 The most memorable units of the Lithuanian-Polish armies were its light horse, its hussars, who famously wore gilt-painted golden wings on their backs in battle. The sight of hundreds of these warriors bearing down on them was enough to make some armies run. But it wasn’t just their looks that won battles. The Lithuanians had fought small battles with reconnaissance forces of the Mongols in their final drives to the west, and learned much from them: fast powerful attacks combined with feints and attacks at weak points. 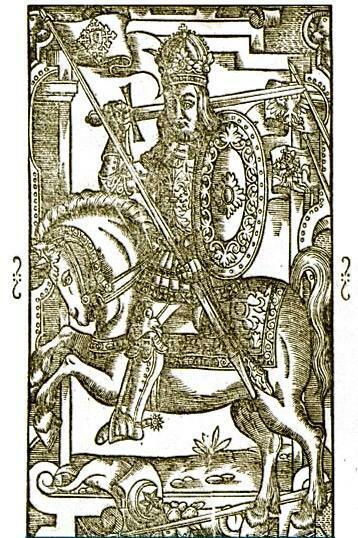 The Lithuanians, like their main rivals the Teutonic Knights, also included heavy cavalry in their ranks. These were the men of the aristocracy, who probably had the most to lose in defeat. In addition to ruling and administration, they spent most of their days in military training. 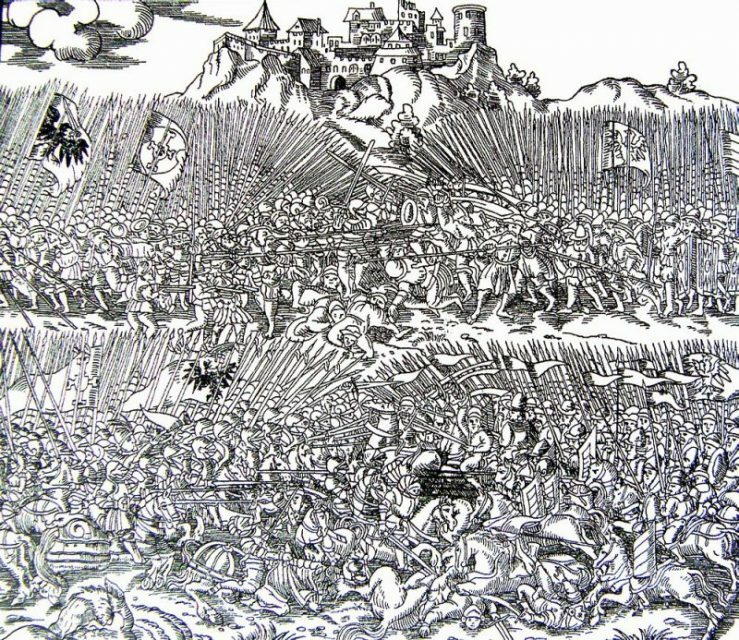 Engraving of the Battle of Grunwald by Marcin Bielski, Kronika wszytkiego świata, 1554. 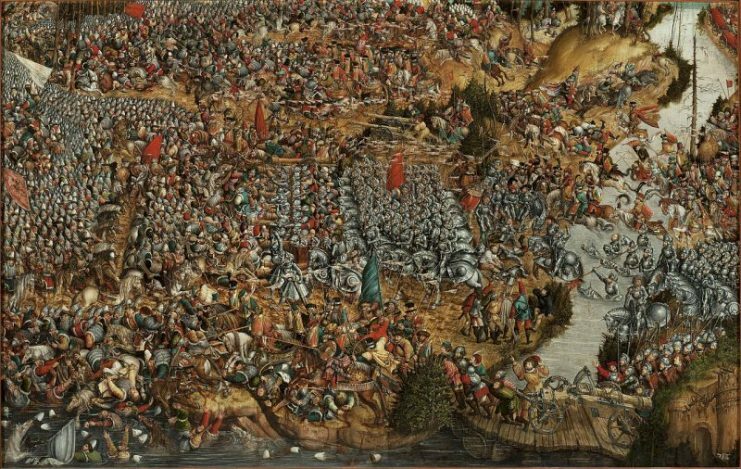 For the Battle of Grunwald, the Lithuanians amassed some 15,000 soldiers. They relied much less on levies of foot-soldiers than other medieval armies, and most of the army was on horseback. The Polish contingent consisted of more heavy cavalry than the Lithuanians had and a larger number of foot-soldiers, mostly levies who carried pikes, as well as archers and crossbowmen. One of the benefits of the Polish-Lithuanian alliance, which became a formal union in the 16th century, was that a number of different men with different fighting styles were included, such as 2,000-3,000 Mongol mercenaries of the Golden Horde. These men proved invaluable, having learned to maneuver their horses rapidly into and out of arrow range. 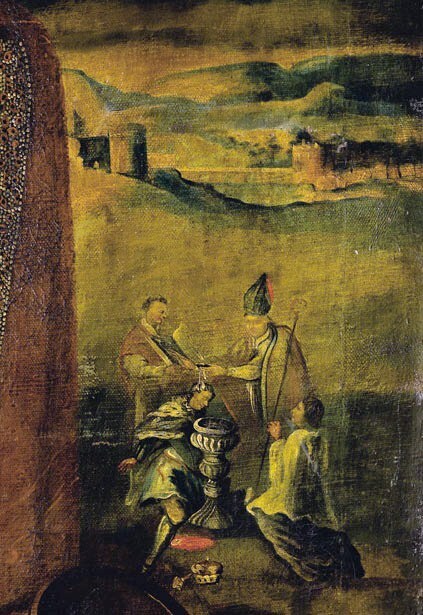 Painting commemorating Polish–Lithuanian union; ca. 1861. The motto reads “Eternal union”. Beginning in the early 1500s, the Russians became more unified and began to push westward. Though the Lithuanians defeated them soundly at the Battle of Orsha in 1514, the wars between the Duchy of Moscow (Russians) and the Lithuanians went on for another seven years, ending in Lithuanian defeat. This defeat led to a military, political and aristocratic union with Poland. Though Polish kings ostensibly ruled, the Grand Duke of Lithuania and the Lithuanian aristocracy ruled their lands as they wished. By the mid-1600’s however, Poland was a growing nation with a population outstripping that of Lithuania, and the Poles gradually dominated the union. Just before Napoleon’s invasion of Russia in 1812, the constant war between the Poles and the Russians took its toll on Lithuania, which was absorbed into the Russian Empire. This ended temporarily when Napoleon took over, but the heyday of the Lithuanian Empire was long past and ended for good when the now great powers of Russia, Austria, and Prussia partitioned Poland/Lithuania again after Napoleon’s defeat. 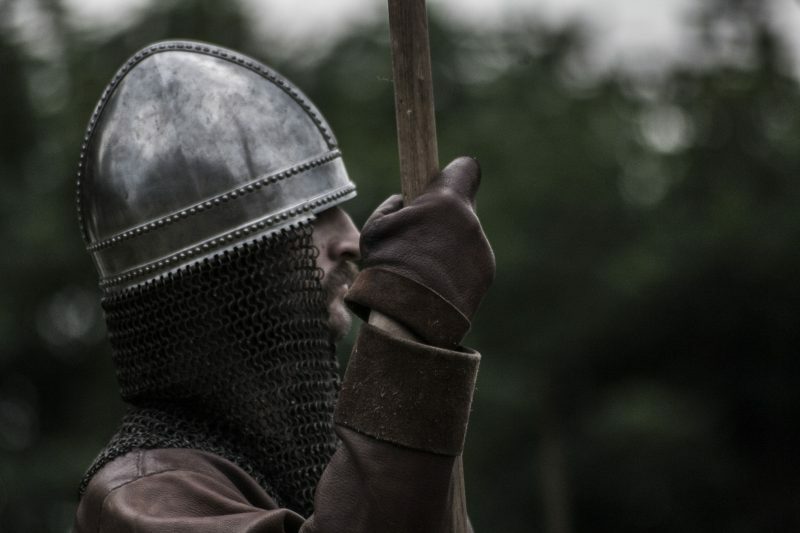 Read another story from us: Stopping The Northern Crusades: Who Halted the Teutonic Knights? Lithuania remained under Russian control until the end of WWI, enjoyed a brief period of independence from the early 1920s to 1940 when Stalin annexed it, survived German conquest, became a Soviet satellite in 1945, and won its independence in the miraculous years of 1989-90. Today, Lithuania is about the size of the U.S. state of West Virginia, but it is free.